This trail begins right at the edge of the town of Sedona and is as picturesque as it is convenient. 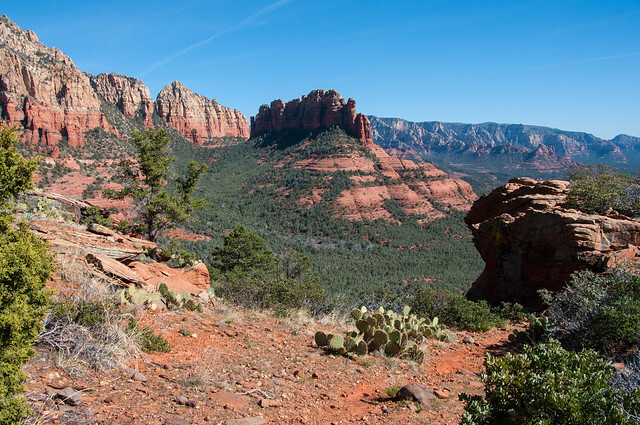 Instead of keeping you tucked away in a deep canyon or clinging to the side of a steep slope as do a lot of other trails in this area, it leads you right out into the open where you can enjoy unobstructed views of the spectacular red rock formations for which the Sedona area and Oak Creek Canyon are famous. Bring along a map to help you identify Coffee Pot Rock, Wilson Mountain, Chimney Rock and more. The hike is not too steep and not too long, but it can be a bit hot during summer. No matter, you'll be glad you braved the heat when you see the views. An alternate approach to the Brins Mesa Trail is to drive out Vultee Arch Road and hike it from that end-same trail, same great views. Red Rock Pass or America the Beautiful Pass required to park at the Jordan Trailhead. Location: 28 miles south of Flagstaff (1 miles north of Sedona) on paved and dirt Forest roads in scenic red rock country. Elevation at the trailhead is 4200 feet. Jordan Trailhead: From Flagstaff, drive 27 miles south on US 89A to Sedona and turn west (right) on Jordan road. Follow it about a mile to the trailhead. The last 1/4 mile of Jordan Road can be a bit rough, but passable by passenger cars. Vultee Arch Road Trailhead: Drive on US 89A through Sedona to Dry Creek Road, turn north about a mile to Vultee Arch Road (FR 152) and north about 2.5 miles to the Soldier Pass trailhead. It's a mile and half hike to the Brins Mesa Trail intersection. High clearance vehicles are required for FR 152. Red Rock Country Maps: Download Red Rock Country trail maps and find other Sedona recreation resources. See the Sedona Northwest and Sedona Northeast maps for this trail. This trail can be hot and dry in summer. Please do not disturb ruins or remove artifacts. From the Jordan Trailhead, this trail goes up and over a low pass to drop down to FR 152 (Vultee Arch Road), where other trails can be accessed for longer rides on Secret Canyon, Bear Sign, or Chuckwagon trails. FR 152 is extremely rough, and impassible for vehicles with horse trailers.